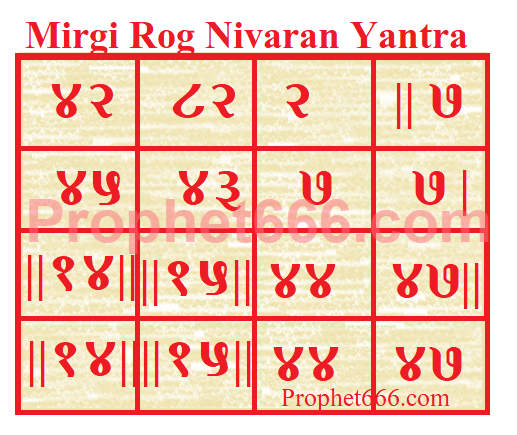 The Yantra is primarily a configuration of special numbers and hence, there is no form of worship or Puja-Vidhi or any other religious or paranormal ritual associated with this Mirgi Rog Nivaran Yantra. It can be drawn on any day on a Bhojpatra with Ashtagandha Paste, using a small pointed wooden stick as the pen. Then, it should be nicely folded and placed inside a cloth or metal locket and worn around the right upper arm. The Tantra says that the Yantra Upay will act like a most efficient Mirgi Rog Ka Gharelu Upchar or a home remedy for epilepsy and will give relief to the patent and over a period of time cure him of this dreaded disease. Related Remedies on Epilepsy which have been published on this site over a period of time. दौरा शांत हो जाता है .